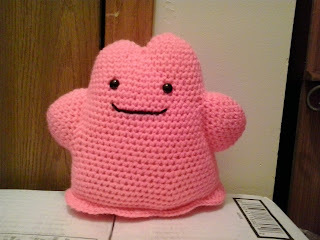 Ditto is a Pokemon that has been favorite of mine. My daughter recently made a list of Pokemon that she would me to make her. Ditto, along with Ditto, was on that list. This pattern includes the color list for Ditto and Shiny Ditto. Worsted Weight Yarn (Shiny alternative in parenthesis): Pink (Aqua) and black. Finish off in first TOP BODY BUMP. DO NOT FINISH OFF IN SECOND TOP BODY BUMP. Rd 8: sc in next 12 sc, holding next sc on BODY and first sc on ARM together and working through both thicknesses, sc in next 5 sc, sc in next 21 sc on BODY, holding next sc on BODY and first sc on ARM together and working through both thicknesses, sc in next 5 sc, sc in next 9 sc on BODY. Rd 9: sc in next 12 sc, sc in next unworked sc on ARM, working behind same ARM, sc in next sc, ch 3, skip next 3 sc, sc in next sc, skip next 21 sc on same ARM, sc in next sc, sc in next 21 sc on BODY, sc in next unworked sc on ARM, working behind same ARM, sc in next sc, ch 3, skip next 3 sc, sc in next sc, skip next 21 sc on same ARM, sc in next sc, sc in next 9 sc on BODY. Rd 10: sc in next 13 sc, sc in next skipped sc on ARM, working behind same ARM, sc in next sc, ch 4, sc in next sc, skip next 19 sc on same ARM, sc in next sc, sc in next 23 sc on BODY, sc in next skipped sc on ARM, working behind same ARM, sc in next sc, ch 4, sc in next sc, skip next 19 sc on same ARM, sc in next sc, sc in next 10 sc on BODY. Rd 11: sc in next 12 sc, sc2tog, sc in next skipped sc on ARM, working behind same ARM, sc in next sc, ch 4, sc in next sc, skip next 17 sc on same ARM, sc in next sc, sc2tog on BODY, sc in next 21 sc, sc2tog, sc in next skipped sc on ARM, working behind same ARM, sc in next sc, ch 4, sc in next sc, skip next 17 sc on same ARM, sc in next sc, sc2tog on BODY, sc in next 9 sc. Rd 12: sc in next 12 sc, sc2tog, sc in next skipped sc on ARM, working behind same ARM, sc in next sc, ch 4, sc in next sc, skip next 15 sc on same ARM, sc in next sc, sc2tog on BODY, sc in next 21 sc, sc2tog, sc in next skipped sc on ARM, working behind same ARM, sc in next sc, ch 4, sc in next sc, skip next 15 sc on same ARM, sc in next sc, sc2tog on BODY, sc in next 9 sc. Rd 13: sc in next 12 sc, sc2tog, sc in next skipped sc on ARM, working behind same ARM, sc in next sc, ch 4, sc in next sc, skip next 13 sc on same ARM, sc in next sc, sc2tog on BODY, sc in next 21 sc, sc2tog, sc in next skipped sc on ARM, working behind same ARM, sc in next sc, ch 4, sc in next sc, skip next 13 sc on same ARM, sc in next sc, sc2tog on BODY, sc in next 9 sc. Rd 14: sc in next 12 sc, sc2tog, sc in next skipped sc on ARM, working behind same ARM, sc in next sc, ch 4, sc in next sc, skip next 11 sc on same ARM, sc in next sc, sc2tog on BODY, sc in next 21 sc, sc2tog, sc in next skipped sc on ARM, working behind same ARM, sc in next sc, ch 4, sc in next sc, skip next 11 sc on same ARM, sc in next sc, sc2tog on BODY, sc in next 9 sc. Rd 15: sc in next 12 sc, sc2tog, sc in next skipped sc on ARM, working behind same ARM, sc in next sc, ch 4, sc in next sc, skip next 9 sc on same ARM, sc in next sc, sc2tog on BODY, sc in next 21 sc, sc2tog, sc in next skipped sc on ARM, working behind same ARM, sc in next sc, ch 4, sc in next sc, skip next 9 sc on same ARM, sc in next sc, sc2tog on BODY, sc in next 9 sc. Rd 16: sc in next 12 sc, sc2tog, sc in next skipped sc on ARM, working behind same ARM, sc in next sc, ch 4, sc in next sc, skip next 7 sc on same ARM, sc in next sc, sc2tog on BODY, sc in next 21 sc, sc2tog, sc in next skipped sc on ARM, working behind same ARM, sc in next sc, ch 4, sc in next sc, skip next 7 sc on same ARM, sc in next sc, sc2tog on BODY, sc in next 9 sc. Rd 17: sc in next 12 sc, sc2tog, sc in next skipped sc on ARM, working behind same ARM, sc in next sc, ch 4, sc in next sc, skip next 5 sc on same ARM, sc in next sc, sc2tog on BODY, sc in next 21 sc, sc2tog, sc in next skipped sc on ARM, working behind same ARM, sc in next sc, ch 4, sc in next sc, skip next 5 sc on same ARM, sc in next sc, sc2tog on BODY, sc in next 9 sc. Finish off. Weave in ends. Insert safety eyes. Stuff BODY firmly. Ditto, Shiny Ditto and Pokemon are copyright Nintendo. Thanks for the pattern! It turned out great! The rounds with the arms were difficult to follow.